The latest slowdown of Metro's 9-month maintenance blitz will be more disruptive than initially planned. Red Line trains will continuously single-track between the Shady Grove and Twinbrook Metro stations starting Tuesday. On weekdays, trains will serve the Shady Grove and Rockville stations every 18 minutes. All other Red Line stations will have near-normal service, WMATA said. Additional trains will operate between Twinbrook and Glenmont and between Grosvenor and Silver Spring during the morning and afternoon rush. Midday and evening trains between Shady Grove and Silver Spring will operate every 18 minutes. Between Grosvenor and Glenmont, trains will operate every 12 minutes, WMATA said. After 10 p.m., trains between Shady Grove and Glenmont stations will run every 20 minutes, according to WMATA. WMATA is encouraging ridingers to avoid the Shady Grove and Rockville stations, if possible. Weekend train schedules may change to coordinate with other planned track work on the Metrorail system, WMATA said. The work zone will be extended the weekend of Aug. 13 and Aug. 14, to include a line segment shutdown between Shady Grove and Grosvenor-Strathmore stations. Free shuttle buses will replace the trains. On Aug. 20 and Aug. 21, free shuttle buses will replace Red Line trains between Grosvenor and Shady Grove stations. White Flint, Twinbrook, Rockville and Shady Grove stations will be closed during this time. Additional weekend service information will be posted here. 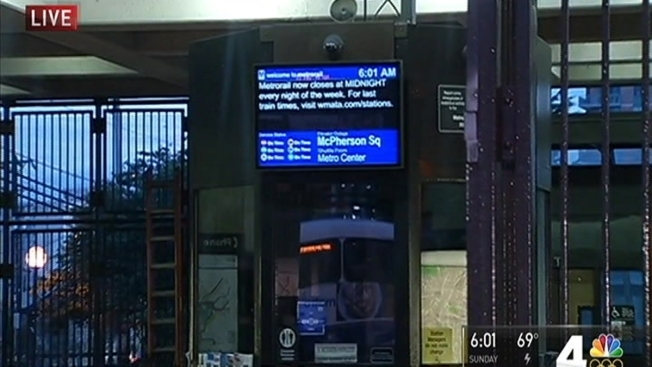 Red Line track disruption will last through Thursday, Aug. 18. A map of SafeTrack Surge 7 alternatives, including MARC and Metrobus routes, can be found here. MARC’s Brunswick Line: This MARC train will take riders from Rockville or other MARC stations to the north to Union Station. The Maryland Transit Administration is planning to add an extra car per train to accommodate more riders. Ride On: Montgomery County’s bus system, will provide a free weekday rush hour shuttle bus service between Shady Grove and Grosvenor stations. Bus Options: Metrobus offers several bus routes. The Q1 and Q2 runs from Shady Grove and makes stops at Rockville, Wheaton, Forest Glen and Silver Spring. The Q4 runs from Rockville to Silver Spring. The Q5 and Q6 runs from Shady Grove, making stops in Rockville and Wheaton. Biking: The Montgomery County Department of Transportation released resources, including bike maps, for getting around by bike. Lyft/Uber: Use ride-hailing apps like Lyft or Uber to get around. Find the Lyft app here for either iPhone or Android, and the Uber app on iTunes here or on Google Play here. Lyft said it will offer Metro riders discounted rides throughout SafeTrack's phases; see discount zones and info here. Uber says UberPOOL, in which passengers share cars, will be available across the entire D.C. area through the year of SafeTrack. Taxi: You can, of course, hail a cab on the street, but you can also order one online or by phone. DC.gov has a list of District taxi companies online here.